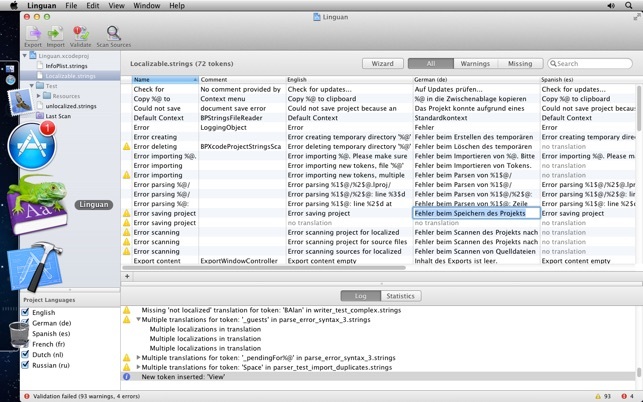 Linguan greatly simplifies localizing your Mac and iOS apps. 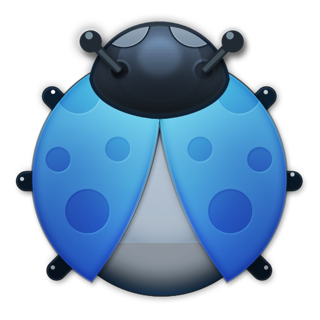 It gives you an intelligent editor for all strings files contained in your Xcode project. You get warned about duplicate tokens or missing translations. Then you can export and e-mail all missing tokens for a specific language to your translator, who can also use Linguan for filling in the translations or use his text editor of choice. When you get the translators results back Linguan automatically merges the results into your project, even if the tokens originated from multiple different strings files. Linguan is the most fun way to clean up your translations. This app was created by people who are using it every day to localize their apps: Peer Assembly, BytePoets and Cocoanetics. - Fixed an issue where opening and re-saving an XLIFF file could swap the source and target languages. Eventhough this app had not been updated for a while, you have nothing to worry about. It does what it’s suppose to do, and we have no complains. Easy and simple way to deal with localizations, if you are doing it on your own. Talk about a tool that should be in Xcode (watch out Linguan developers as Apple will see this and it will be in Xcode at some point!). I am working hard on the next release of JetSet Expenses and working on localization. The first time I fired up Linguan and saw that I had missing strings I was thrilled with my purchase. The tool is fantastic! It is going to make my life so much better that is for sure. How you use it is simple. You open your Xcode project and it immediately does a scan of your string resources and figures out what langagues in your project you have and show a list of warnings related to strings that are in the base langauge that are not in translation. Not only that you can edit the strings within the UI placing comments in and that also works. A great product. There may be a better method than what I do but today I put placeholder strings within UILabel and UITextField controls in interface builder where I visually scan to insure that they do not show up when I run the product. These visual tags help me insure that I catch hard coded strings. What I would love would be a tool that would scan the XIB files in my project looking for those tags so I could find where I have missed a hardcoded string in the UI. Anyway--it is a great tool. If you are a developer who wants to do localization--buy this! Being an App Developer (iPhemeris on both Mac and iOS) I wanted to take the time and express my appreciation for this App! It’s great. I just started using Linguan and really like it. It is saving me A LOT of time. It found missing and duplicated localization strings and really helped me get the mess (I had no idea even existed) sorted out. Prior to this I was editing, and trying to organize, all the localizations in the individual localization files in the various versions of my Apps. It was just getting to be way too much given that I’ve localized into about 10 languages. This thing saved my life. I edit the strings right in Linguan and don’t ever want to look at localization files anymore. Thanks guys very much for this cool tool!